Whenever I travel I always visit a local bookstore so I can browse through the cookbooks. I especially like regional cookbooks as they usually reflect the local cuisine. On one of my visits back home to Nova Scotia, I bought a terrific cookbook called 'Out of Old Nova Scotia Kitchens' by Marie Nightingale. What makes this book so unique is the background story for each recipe and how she also provides some interesting history of Nova Scotia. One recipe that caught my attention was for a Cinnamon Loaf, an old family recipe that a woman in her 80's got, in turn, from her mother. This is your classic 'crumb' Coffee Cake recipe. It is quite similar to the Coffee Cake recipe on the site, only it's baked in a loaf pan. This cake has a rich and buttery flavor and soft moist texture. I love the cinnamon sugar topping that sits on top of the cake plus runs through the cake. You can serve this cake while it's still warm from the oven, at room temperature, or even cold. Leftovers can be covered and stored for a few days at room temperature. Coffee Cakes are the informal cakes, the ones for everyday. Although called a "Coffee" Cake, it does not usually contain coffee. The name more often refers to how the cake is eaten, that is, with a cup of coffee. This Coffee Cake is like a butter cake, that is, it's leavened with baking powder and baking soda, not yeast. The recipe calls for buttermilk which has a thick and creamy texture with a rich tangy buttery taste that makes the cake nice and tender. You can buy buttermilk or you can use buttermilk powder. Or you can make sour milk, which is actually what was called for in the original recipe. To make sour milk stir 1 tablespoon of white distilled vinegar, cider vinegar, or lemon juice into 1 cup (240 ml) of whole or reduced fat milk. Let stand at room temperature for about 10 minutes before using. 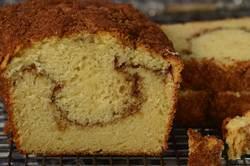 Cinnamon Swirl Coffee Cake: Preheat your oven to 350 degrees F (180 degrees C). Butter (or spray with a non stick vegetable spray) a 9 x 5 x 3 inch (23 x 13 x 8 cm) loaf pan. Line the bottom of the pan with parchment paper. Cinnamon Sugar Topping: In a small bowl stir the brown sugar with the ground cinnamon. Coffee Cake: In a bowl whisk or sift together the flour, baking powder, baking soda, and salt. In the bowl of your electric mixer (or with a hand mixer), beat the butter until softened (about 1 minute). Add the sugar and continue to beat, on medium high speed, until light and fluffy (about 3-4 minutes). Add the eggs, one at a time, beating well after each addition. Scrape down the sides and bottom of the bowl as needed. Beat in the vanilla extract. With the mixer on low speed, add the flour mixture (in three additions) alternately with the buttermilk (in two additions), starting and ending with the flour. Mix only until combined. Spoon about half (450 grams) of the batter into the prepared pan, smoothing the top with an offset spatula or the back of a spoon. Then sprinkle on the batter about half (30 grams) of the cinnamon sugar topping. Cover with the remaining batter and then sprinkle with the remaining cinnamon sugar topping. Take a wooden skewer or knife and swirl the batter. Bake for about 55 minutes, or until a toothpick inserted into the middle of the cake comes out clean. Remove from the oven and let cool on a wire rack for about 10 minutes before removing from pan. Serve warm or at room temperature. Can be stored at room temperature for about three days or it can be frozen for about one month. Note: You can make a good substitute for commercial buttermilk. Stir 1 tablespoon lemon juice into 1 cup (240 ml) milk. Let stand at room temperature about 10 minutes before using.